1) Mix yeast with water and set aside. Preheat oven to 400 degrees. 2) Combine flours and salt in a large bowl. Keep in mind that the dough can triple in size, so make sure the bowl is large enough. 3) Mix yeast water into flour/salt mixture and stir until the dough forms together into a solid mass. If it seems too wet, add more flour and continue stirring. When finished, the dough should still be slightly tacky to the touch; try to avoid making the dough too dry. Note that whole wheat dough needs slightly more water than white dough. 4) Knead dough for 10-15 minutes, using either a large, flat kitchen utensil or well-floured hands. 5) Cover bowl and set aside in a warm place to rise. Check in 1 hour; if dough seems at least doubled in size, it’s ready for the next step. If not, let it sit for another 30 minutes or so. 6) Using a serrated knife or razor blade, slice the dough ball in half. Place each half on a floured surface, knead a few times, and shape into two loaves. 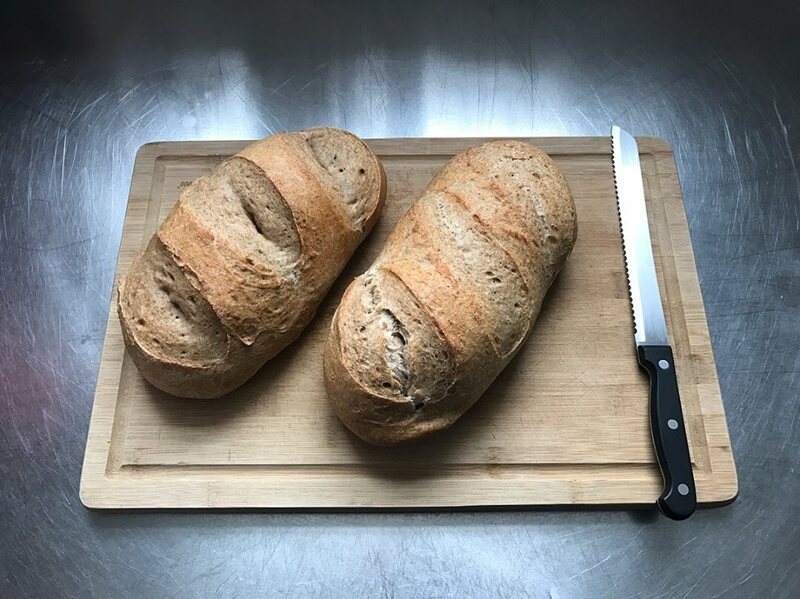 Place each loaf on an oiled baking pan and make three decisive slashes in the surface with a serrated knife or razor blade. If you wish, you may baste the loaves with olive oil; if not, baste the surface with a very thin coating of warm water to keep the surface from drying out too fast. 7) Allow loaves to rise for about 45-60 minutes. When they appear about doubled in size, place in them in oven and bake for 25-30 minutes or until surface is golden brown. To encourage crust formation, you may wish to toss some hot water on the inside surfaces of the oven during the first few minutes of baking to fill the inside of the oven with steam. 8) Allow to cool for 5-10 minutes before slicing with a large serrated knife and serving. Extra loaves may be frozen and reheated later. Otherwise, consume within 3-4 days for optimum freshness.